Innovation and Enterprise Architecture are not often used in close proximity to each other, but that is not to say they are mutually exclusive. If anything, given the increasing complexity of digital businesses, it is probably time for Enterprise Architecture to play a more prominent role in bringing innovative business models to life. 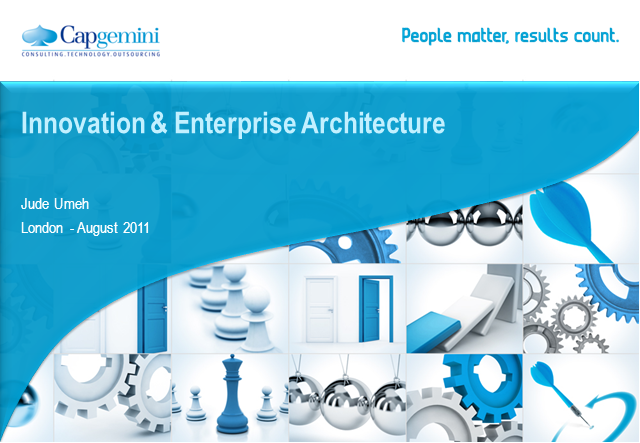 To do this successfully, the focus must be on three key dimensions of: People, Process & Technology, and this talk will explore these, and other significant themes, in discussing the role of Enterprise Architecture and innovation. The broader vision, (plus a wealth of skills / experience / knowledge), that is available to an Enterprise Architect makes it a critical role in creating a culture of innovation. However, EA has an image problem, arguably due to a misconception of it being restrictive or otherwise limiting to the spirit of innovation, and this has to change in order for EA to take its place as a key enabler for innovation. Jude Umeh is a Senior Consultant & Enterprise Architect with Capgemini in the UK, and he enjoys helping to define future business and technology strategies that shape clients' response to a challenging digital environment. Jude is a published author, with a book and several articles and whitepapers, on the impact of digital content technologies. He is also a frequent blogger on Capgemini’s award winning technology blog.